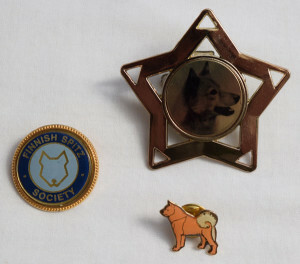 We have the Society’s own enamelled metal logo badge and a small enamelled metal Finnish Spitz pin badge made for the SPJ in Finland. 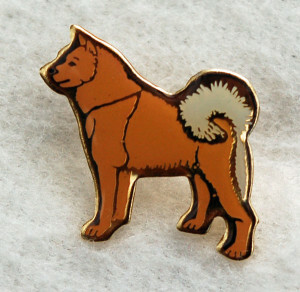 We also have a star-shaped show ring clip with a Finnish Spitz image. 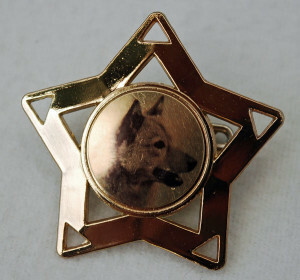 A star-shaped metal show ring clip in a gold colour with an image of a Finnish Spitz head in the rounded centre. Grip clip and safety pin on reverse. Size 6 x 6 x 2 cm. Weight 19 grams. A round metal enamelled badge with safety pin on the reverse. 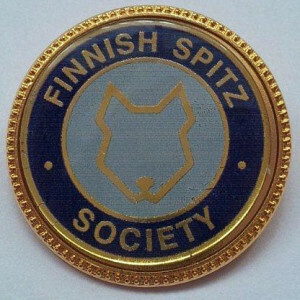 The front has the Finnish Spitz Society's logo in gold on a pale blue background and the words "Finnish Spitz Society" in gold on a dark blue background. The rim of the front and the whole of the reverse is a gold colour. Diameter 3 cm. Weight 10 grams.